Whether at the Capitol or across the state, we advocate for a real reduction in the tax burden on households and businesses in Iowa. But what principles should Iowa’s tax code adhere to? Fair: Iowa’s tax code should be fair and not favor one group of taxpayers at the expense of another. Competitive: Iowa should have lower tax rates rather than the current high tax rates that make our state less competitive with our neighbors. The Iowa tax code should encourage, rather than hinder, economic growth. Transparent: The Iowa tax code is complex and needs to be simplified. A tax structure that is simpler and easier to understand will be friendlier to taxpayers. Taxpayers in Iowa deserve transparency and accountability when it comes to tax credits and incentives, too. Limited: Iowa’s tax code should be limited, that is, taxes should only be collected to finance the essential functions of state government. It is immoral for government to believe that they have an unlimited claim to the hard-earned income of individuals and businesses. Protective of Freedom: Iowa’s tax code should promote freedom. Taxes should not be used for social engineering. Iowa should not create new taxes or substitute one tax for another. 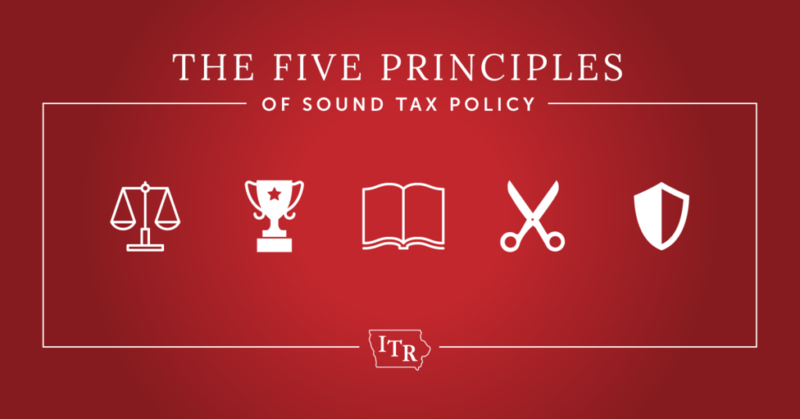 A tax code that follows these principles while reducing the tax burden on Iowans will allow everyone to keep more of their hard-earned dollars. This will encourage economic growth and boost additional investment, ultimately providing more revenue to address the priorities of state government.